Swype is unquestionably the latest typing craze to hit phones since the introduction of QWERTY keyboards. Sure, advancements in predictive text and auto-completion are great, but this is truly revolutionary. Tech publications, including Skatter Tech, have been buzzing about Swype recently, touting its benefits over the current “tap and peck” method for text entry on touchscreen keyboards. 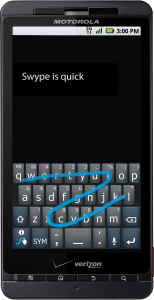 Even Motorola’s Mobile Devices CEO Sanjay Jha bragged about how fast he could type using Swype during last month’s Droid X press conference. While the Samsung Omnia II was the first device to ship with Swype, the Droid X is still one of the few flagship smart phones to offer it. The upcoming Samsung Galaxy S devices for AT&T, Sprint, and Verizon will also sport Swype, though, a sign that it could possibly come with most major smart phones soon. After nearly a month of using Swype to do everything from answering texts and emails to updating Facebook statuses and chatting with friends, I’d like to share a few thoughts about my experience with it. Let me start off by saying that I am not a fan of touchscreen keyboards. At all. I love the tactile feel of physical keys beneath my fingers while I’m typing, and haptic (vibrating) feedback just doesn’t cut it for me. I don’t see how people with large hands can type anything on these keyboards. I have tiny fingers and I still manage to press the wrong keys! I’ve had this problem with the iPhone 3GS, which features one of the best touchscreen keyboards, and I even found the Droid X’s default multi-touch keyboard difficult to use despite its large screen. Typing often got frustratingly slow using the multi-touch keyboard, as I had to go back constantly to correct misspelled words. Fed up after an hour of trying to make it through a sentence without typos and spending over ten minutes on a five line email, I finally gave in and switched to the pre-installed Swype keyboard. If that video didn’t convince you that Swype is unlike anything you’ve ever seen, then I probably have nothing more to say that will change your mind. Swype goes far beyond the days of graffiti for Palm Pilots. The technology doesn’t require pin-point swyping accuracy, either. Running your finger across a set of keys within reasonable proximity of those that form a word is generally enough; however, if Swype is unsure about your input, it presents a popup with four possibilities and a second page with another four. And if a word isn’t recognized, tapping it in the old fashion way will register it into the dictionary, and Swyping that same word a second time around won’t be an issue. Full sentences are just as easy. To swype something like “My Droid X Rocks,” all I need to do is run my finger across the letters of the first word, lift my finger briefly, and then continue on to the second word. I found it very handy that Swype automatically selected the first option in the word suggestion box without making me have to physically touch the word to select it. This meant that I could continue swyping the next word in my sentence while Swype inserted the first option, dramatically speeding up my typing. However, the main reason for faster typing I found was the fact that I didn’t ever have to stop to hit the space key. Hitting the space bar is entirely optional with Swype, as the keyboard automatically recognizes where one word ends and another begins. In terms of the learning curve, it’s actually fairly intuitive. The software walks you through a tutorial when it’s first activated. After that, I more or less got the hang of it in under a minute. 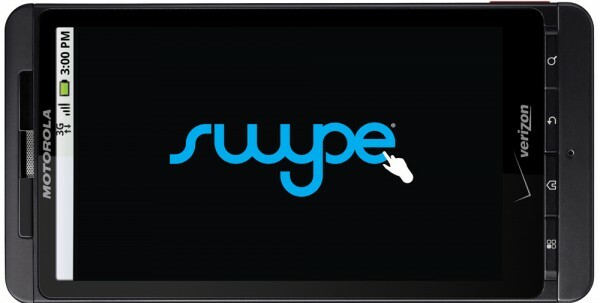 Within an hour I felt completely comfortable using Swype. After swyping only a few sentences, it becomes clear how much faster it is. I was able to write texts using Swype, with minimal typos, in nearly half the time it took me to tap the same message on the standard multi-touch keyboard. While the entire idea sounds great, there’s one major flaw with Swype: it is very, very easy to make mistakes. And that’s not entirely because the technology is flawed, but because we are. Most of us know how to type on traditional QWERTY keyboards because they’ve been around for ages, and we’ve been trained to type exclusively on these keyboards. Veteran typists have the muscle movements memorized for most common words. Because Swype doesn’t use the traditional typing method, however, muscle memory got in the way more frequently than I expected, especially when it came to words with trickier spellings. One of the most problematic words for me was “definitely,” a word that I don’t normally have trouble typing because I know the finger pattern. However, with Swype I had to think twice about whether it was spelled with one “E” or two and what the overall letter sequence was. This was more of a minor nuisance for me, since I have relatively decent spelling, but I can imagine it being a real problem for those who aren’t great at spelling and rely heavily on spell check or autocorrect. Unlike conventional typing, spelling does make a difference in determining whether or not Swype knows what you are trying to say. I’ve found that Swype is only right about 75% of the time in what I’m trying to say. I’m going to chalk up most of this to my inability to swype accurately, but it has led to some fairly entertaining typos. For instance, it inserted the word “fruit” instead of “for” in an email to a friend. But a more serious incident was when the “o” in the word “dock” was swapped with the letter “i” in a work-related conversation with my boss. While he laughed it off, I’m pretty sure it wouldn’t play out so well in other situations or with other bosses. Swype is also very problematic when it comes to passwords. There’s simply no way to verify that you’ve entered a password correctly using Swype, since the text is covered with astericks. Passwords that are standard dictionary words, which is highly unrecommended, may work with Swype, but entering complicated ones with symbols, numbers, and capital letters isn’t just annoying, it’s nearly impossible. Fortunately, the Swype keyboard also works as a regular tap-enabled keyboard when needed, though I wouldn’t recommend using it this way for anything other than odd words or passwords. Overall, I think Swype is a fantastic addition to smart phones and is great for people like me who find regular single-letter tapping on touchscreens difficult and downright frustrating. Of course, it isn’t perfect. It has some problems with typos, and does go against the way we have been taught to type. However, these problems are more minor nuisances than serious issues and definitely do not outweigh the speed benefits that come with Swype. After using it myself, I now see why people have been so excited by this new text input feature, and I can honestly say that I would recommend Swype to all smart phone owners. Editors Note: This article was co-written by Sahas Katta and Alex Harvey-Gurr. Also thought I would mention SlideIT, which is a replacement keyboard similar to Swype and is available already for Windows Mobile Symbian and Android as a free trial and a paid app.